To hang curtains, you can use the ready clamps or choose a model with the already sewn fabric loops. However, there is another option – to do aerial loops of thread on your own. This work will not take much time and will require minimal skills in sewing. 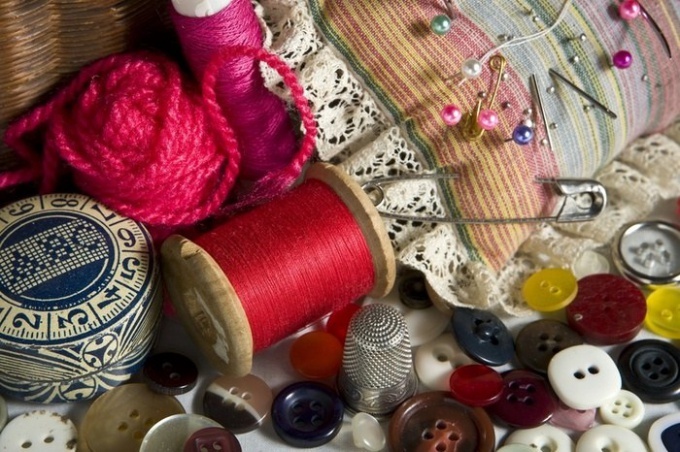 Buy sturdy cotton thread that matches the hue with the fabric from which to sew curtains. You need a needle with a wide eye or thin metal hook, small scissors and thimble. Before starting, pull up curtains. Follow ACC the top and bottom edge and stitch the fabric on the machine or run the seam by hand. Athlete hemmed cloth. Pass the needle double thread. Tailor's chalk mark the places where they will be sewn loop. The smaller the distance between them, the more frequent will be the folds of the fabric and the smoother will form the finished curtain. Look down from the top edge of one or two centimeters. Do not make loops at the bend of the curtains. The hooks on which it will be attached, should be hidden by the edge of the fabric. Loop run on the wrong side of curtains. Carefully insert the needle into the fabric so that on the outside of the stitches was the most visible. Secure the thread with several small stitches and pull it in the form of a loop about an inch long. Again lock the thread. Panel the resulting workpiece. Insert the needle into the hole formed by the thread and pull it through the formed loop. Tighten the knot. Repeat until the base is fully overwound thread. The resulting slide stitches to each other, so they went as tight as possible. Properly sheathed loop should resemble a hard cord, not curl up and keep good form. After finishing the first loop, secure the thread and trim it. Run the second loop, focusing on pre-made undo. So do some of the same fasteners. Instead of a needle you can use a hook. It is convenient to do the loop on the fabric with sparse structure of the matting, linen, tulle. The hook allows you to do the job faster and neater, but it is not suitable for very thin or too thick fabrics. Mark locations for future fixtures. Take a thin metal hook and strong cotton thread of moderate thickness. Push the hook into the fabric and pull them to the thread. Tie a knot in it, securing the base of the loop. Leave enough thread length of about a centimeter, again push the hook into the fabric and do the mount for the second side of the loop. Tightly obviate its columns without nakida.